Here is the pattern for Lorraine's Prom Gown from Back to the Future. For this dress, I kept revising the pattern because I wasn't completely satisfied with the results. I guess that I'm a perfectionist. :) Anyway, I am satisfied with this version. Row 1: With coral, ch 40, 1 sc in 2nd ch from hook, 1 sc in each ch across, turn. Rows 2-10: Ch 1, (1 sc in the back loop of next st, 1 sc in the front loop of next st) across, turn. Row 11: Ch 1, 1 sc in back loop of next st, (1 sc in front loop of next st, 1 sc in back loop of next st) 5 times, (2 sc in the front loop of the next st, 2 sc in the back loop of the next st) across to last 11 sts, (1 sc in the back loop of next st, 1 sc in front loop of next st) across last 11 sts, turn. Row 12: Ch 1, sc in the back loop of next st, (1 sc in front loop of next st, 1 sc in back loop of next st) 5 times, 2 sc in the front loop of next st, (1 sc in back loop of next st, 2 sc in front loop of next st) across to last 10 sts, (1 sc in front loop of next st, 1 sc in back loop of next st) across, turn. Rows 13-16: Ch 1, (1 sc in front loop of next st, sc in back loop of next st) across, turn. Row 17: Ch 1, 1 sc in the back loop of next st, (1 sc in front loop of st, 1 sc in back loop of next st) 5 times, (sc dec over next 2 sts in back loops, sc dec over next 2 sts in front loops) across, to last 11 sts, sc in the back loop of next st, (sc in the front loop of next st, sc in back loop of next st) across last 11 sts, turn. Row 19: Ch 3, (you will sc in both loops of st) 1 dc in each st across, turn. Row 20: Ch 1, in BACK LOOPS ONLY, 1 sc in 1st 20 sts, turn, leaving remaining sts unworked. Row 21: Ch 1, sc dec over 1st 2 sts, 1 sc in each st across, turn. Row 22: Ch 1, 1 sc in each st across to last 2 sts, sc dec over last 2 sts, turn. Fasten off. For other side, turn piece so that the opposite side is facing you. Row 19: In FRONT LOOPS ONLY, join thread, ch 1, 1 sc in each of the next 20 sts, turn. Row 20: Ch 1, sc dec over 1st 2 sts, 1 sc in each st across, turn. Row 21: Ch 1, 1 sc in each st across to last 2 sts, sc dec over last 2 sts. Fasten off. Turn piece so that the wrong side is facing you. Starting on right side, go to row 19. (You will work into unworked loops) Count 15 sts into row. Join thread in next st. Ch 16, go back to 7th st of row, sl st in that st, turn, 1 dc in each ch across. Fasten off. Repeat on opposite side of row. Row 1: Join coral at bottom of the top. (You will be sc'ing in the loops of the chains) Ch 1, 2 sc in each ch loop, across, turn. Rnd 2: Ch 5, (sk 2 sts, dc in next st, ch 4) repeat across, join, turn. Rnds 3-? : Ch 5, (sk 1st ch loop, dc in next set of ch's, ch 4) around, join, turn. Repeat this rnd until the skirt reaches Barbie's knee or until it reaches desired length. Weave in all ends. Make one Barbie Romantic Tutu. 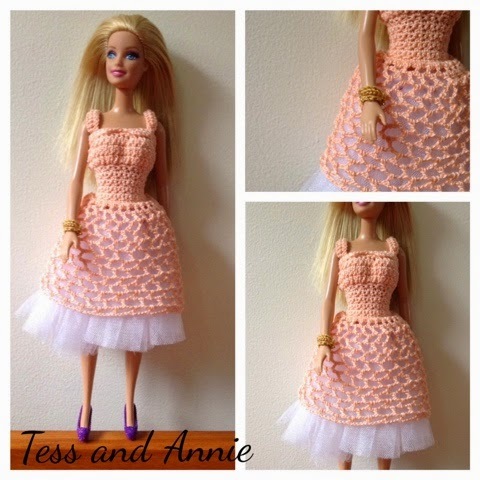 Put dress on doll and underneath the lace part, put the tutu. Sew it to the waist underneath. This dress is beautiful! Fun idea for Barbie to have a prom dress. Hehe. But I really like it! Pinned.